The alleged victim has testified in the trial of former UCSB soccer player Eric Frimpong, pictured here with his attorney Robert Sanger (right) in front of Judge Brian Hill during summer hearings. The prosecution has rested in its case against 21-year-old former UCSB soccer player Eric Frimpong, leaving attorney Robert Sanger to state the defendant’s case. Frimpong is facing a felony sexual assault charge as well as a misdemeanor charge. To close the day Wednesday, Sanger called Dean Warden, a senior criminalist at the Goleta Department of Justice lab and the man who analyzed a blood sample taken from the 19-year-old alleged victim. Warden said the young woman’s blood alcohol level at the time the sample was taken-5:37 a.m.-was .20. Through rough estimations, concluded that the alleged victim’s BAC was between .282 and .31 at midnight and between .267 and .29 at 1 a.m. Prosecutor Mary Barron is alleging that Frimpong raped the UCSB student at some point in this time period. According to earlier testimony from the young woman, Frimpong took her down to the beach after playing beer pong at his house on Del Playa Drive in Isla Vista, where he became aggressive and raped her. The girl’s memory is fuzzy on exactly what happened, but she seemed certain in her testimony that it was, in fact, Frimpong, who had allegedly assaulted her. The defense has argued that the alleged victim’s memory was too fuzzy to remember any of the details, and Sanger, who readily admits the two met each other and hung out that night, has suggested that the girl blacked out – as she admittedly has several times in the past – and she is unclear of how and by whom she was assaulted. The fact that she was assaulted by someone that night is not in question. The young woman had what experts described as bite marks on her left cheek, as well as one of her buttocks. She also testified to being hit in the head, although she didn’t remember being bitten. Dr. Norman Sperber, possibly one of the most well-known forensic dentists in the country who has testified in more than 230 trials both criminal and civil, testified Wednesday that, after studying photos of the marks on the young woman as well as moldings taken from Frimpong’s mouth, he couldn’t rule out Frimpong as having made those marks. He could, however, rule out that the alleged victim’s intimate partner Benjamin Randall, whom the defense has speculated should be the one charged with the crime, made the bite, based on a mold taken of his mouth. Randall’s sperm was found in the young woman’s underwear she was wearing that night, and he admitted to being upset when he saw Frimpong and the alleged victim together on Del Playa the night of the incident, February 16. Randall denied on the stand that he had followed the two after seeing them from a distance that night. Sperber admitted that studying bite marks is not a science, and, when pressed by Sanger, even admitted to some cases in which he later contradicted a previous analysis. Earlier, there had been an argument outside the presence of the jury Wednesday in which Sanger attempted to have Sperber’s testimony impeached. Detective Daniel Kies, the lead investigator in the case, had gone to a local dentist, Dr. Raymond Johansen, to see if he could possibly render an opinion. Kies testified Tuesday that he had gone to the local dentist on a recommendation of a sergeant in the department, and because speed was a necessity, but decided not to use the dentist after the dentist gave a price quote. While Kies said he didn’t remember Johansen giving an opinion, the dentist testified that he had indeed offered a preliminary opinion. Kies didn’t file a report about his contact with Johansen, which irked Sanger, who had found out about the encounter just by chance. Judge Brian Hill also noted that Kies was wrong not to file a report. It was the second time the prosecution had not provided information to Sanger, Hill said later. The second came after Sperber testified that he was, in fact, charging the prosecution money for his work. Kies had represented on the stand the previous day that one of the main reasons they decided to use Sperber was that he didn’t charge anything, but Sperber, who is from San Diego County, testified he was actually charging $300 per hour for his work, and $400 an hour for time spent on the witness stand. While Hill didn’t opine on whether he thought it was intentional, Hill did admonish the prosecution to be forthcoming with all information with regard to the case. “There may have been some confusion, but this is information that should’ve been turned over long before the trial,” Hill said. Sanger isn’t expected to call Frimpong to testify in his defense and closing arguments are expected to take place Friday with the matter going to the jury by noon. Frimpong has received steadfast support from a small group of friends and former teammates. 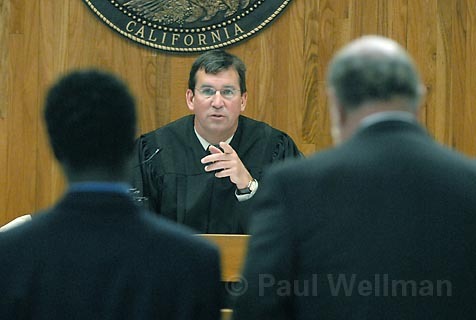 For the first time since the trial began November 28, Frimpong’s soccer coach at UCSB Tim Von Steeg attended the trial, showing up for both the morning and afternoon sessions in Santa Barbara Superior Court Judge Hill’s courtroom.